This paper presents a human cartographic approach to the analysis of the impact of austerity and the economic crisis across Europe’s regions. First, the paper reflects on past insights and debates on the analysis and mapping of poverty and wealth and of the effects of austerity in particular. It then presents and discusses a wide range of cartograms and maps (including the subjects of unemployment and poverty as well as related themes such as educational attainment and migration). 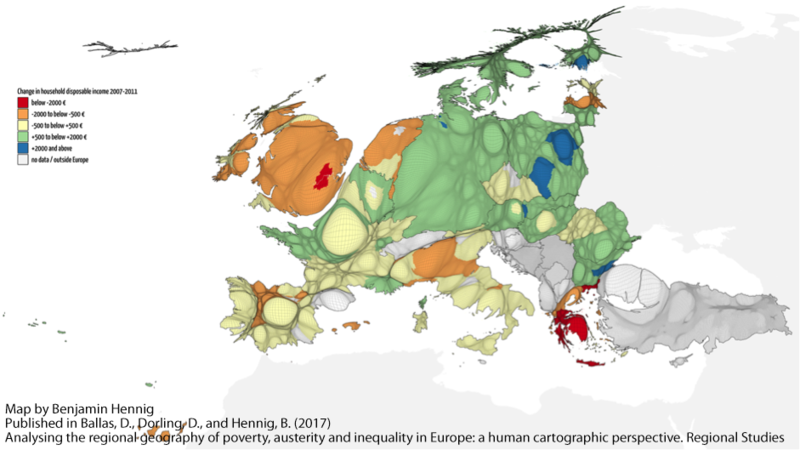 These images highlight social and spatial inequalities and also illustrate that the most severe social divides within Europe are more often within states rather than between them. To that end the paper also argues the case for a co-ordination of urban, regional, national and European policies and EU spending to ameliorate the impacts of austerity and to enhance social and territorial cohesion. Finally, the paper highlights the increasingly important role of geographers and of the field of Regional Studies in so many recent debates about the future of the European project and of the possibility of a Europe of cities and regions rather than a Europe of nation-states.